Kelly Buchberger: "Save Your Money"
Satirical and a fun little jab at myself and Irbe, this piece was signed in person at the Summit Show in Edmonton on June 4, 2011. Due to my photographer manning my booth at the show, no accompanying photos were taken of Buchberger. Grant Fuhr: "One of the Best"
A complimentary line about Archie signed in person by Grant Fuhr at the Summit Show in Edmonton, Alberta on June 4, 2011. 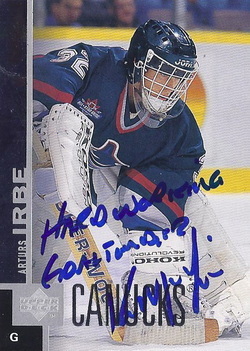 Below: Grant Fuhr smiling as he signs the Irbe card that I presented to him. Bill Ranford: "Let Your Equipment Guy Fix Your Pads!" A hilarious comment by Bill Ranford regarding Irbe's notoriety for fixing his own pads with a needle and thread. Signed in person at the Summit Show in Edmonton, Alberta on June 5, 2011. Below: Bill Ranford signing my 8X10 as I (not pictured) prepare to give him the Irbe card (seen above) to sign. Andy Moog: "A Glove in a Box!" When Arturs Irbe and Andy Moog were on the Stars in 1996-97, Moog bought a glove from his company for Irbe. The twist was that the glove was in pieces and had to be assembled. Irbe tried to assemble the glove for a season before giving up and never being able to finish it. That is why Moog wrote "A Glove in a Box!". This item was signed in person at the Summit Show in Edmonton, Alberta on June 5, 2011. 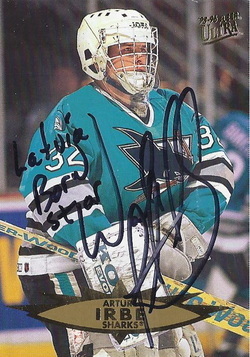 Kelly Hrudey: "Loved Talking to Arthurs, Very Thoughtful Guy!" This was the first attempt at this project TTM, as every other attempt was made (and was successful) in-person. Mr. Hrudey signed clearly and did exactly what I requested kindly of him by making a kind statement about Archie. This was received in the mail on February 15, 2012. This item was sent through the mail to Kelly, so there are no accompanying photos. Despite the difficulty of getting this done with AJ Sports World policing the autographs at the Toronto Spring Expo, I managed to get Kirk McLean, a former teammate of Archie's (1997-98), to sign a base card of Irbe on Sunday, May 6, 2012. Below: Kirk McLean thinking about what to say as he prepares to sign the Irbe card that I presented to him. This card was presented to Mr. Hunter in person at the 2012 Summit Show in Edmonton, Alberta on June 2, 2012. 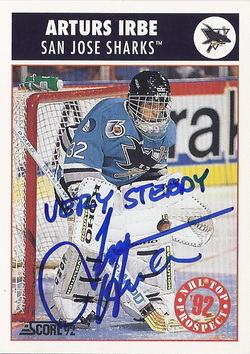 He willingly took part and wrote a sincere comment about Irbe's skill as a goaltender. Below: Tim Hunter preparing to sign the base card that I presented to him. This card was signed in person by Gerry Cheevers at the Summit Show III in Edmonton on June 3, 2012. The comment is excellent! Cheevers comedically asks why there are no stitches on Irbe's mask. The funny part of that, for those who know hockey, is that Cheevers had a goalie mask on which he added a new set of stitches to it everytime he got hit in the face. Wade Flaherty: "Latvia born star"
This card was signed in person by former Sharks goaltender/Irbe teammate Wade Flaherty during a Winnipeg Jets off-season training in mid-July between the 2011-12 season and 2012-13 season. Huge thanks to Tim (TurcoCollector3) for getting me this and the Daley. Very much appreciated my friend! Joe Daley: "My Old Equipment Looked Newer!" 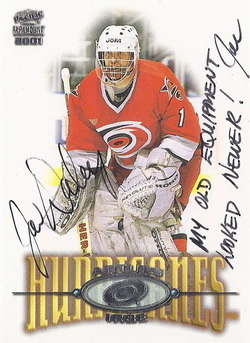 This card was signed in person by former NHL goaltender Joe Daley at his own sports card shop in Winnipeg called "Joe Daley Sports Cards". Huge thanks to Tim (TurcoCollector3) for getting me this and the Flaherty. Very much appreciated my friend! This request was sent to Theo TTM at the end of June 2012 and was finally received back on November 7, 2012 along with the 8x10 autograph which I requested of him. Unfortunately he forgot to sign the end of the card after the comment, but I still added it into this database regardless.